Pioneers in the industry, we offer stretch wrap films from India. As an acclaimed enterprise of the industry, we are offering a broad range of Stretch Wrap Films. This wrap film has ultra high clarity for ease of product identification and barcode scanning and is virtually silent to apply. 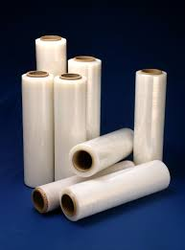 Offered wrap film is used to utilize and save the products during shipment or storage. Additionally, we offer this wrap film in various specifications according to the demand of customers. Looking for Stretch Wrap Films ?